Leigh Touchton, president of the Valdosta-Lowndes NAACP, says the local and state NAACP are opposed to the biomass plant because the community that is most affected is the minority community. She referred to her previous presentation of a letter from Dr. Robert D. Bullard. She also brought up an incident with Brad Lofton and recommended that VLCIA hire an executive director who wouldn't act like that. I've taken men through there, I've signed them up. She referred to me when she said that, so what I said before is appended after the video. For anyone who wants to review what the Industrial Authority did in its last regularly scheduled meeting, which was 17 May 2011, before going to today's irregularly scheduled meeting, here is a playlist. Mr. Jerry and I met on May the second to review the... I was kind of educating myself as to the current operating budget and how it applies... goes into forming next year's budget.... There's just a few differences from the 2011 budget to the proposed 2012 budget. Line item 32: Park maintenance. Miller Business Park is added for this year. "Improve signage at some of our entrances." Chairman Jerry Jennett asked board members to take it home, redline it, and bring it back for a vote next meeting. Clearly audible outside are people honking at the biomass protesters. Col. Ricketts reported he was on a panel at the 2011 Economic Summit which was sponsored by the Chamber of Commerce, and that he got a copy of a report by the VSU Center for Business and Economic Research about how the local area compares with others. Mary Gooding said Col. Ricketts represented VLCIA very well. If VLCIA knew how to do PR, this would have been a great PR opportunity for them to publicize. Meanwhile, WALB and VDT reported on the event itself. VLCIA is still indecisive about minutes online, but is at least talking about it. Support for publishing minutes came from a surprising source. Col. Ricketts said he had been asked by Roy Copeland to look at putting the minutes online and had talked to local authorities (Parks & Recs, Hospital, Prison, Airport) and other economic development authorities around Georgia (Macon, Albany, Tifton, Columbus, Savannah, and Augusta) and found none of them publish minutes online. He said their concern was prospective project details. Chairman Jerry Jennett reported that VLCIA was generally operating at a slower pace due to the economy. Roy Copeland asked for the board to come back to the operating budget later in the meeting when they could ask their CPA a few questions. He was out of town, so they agreed to try to get him on the telephone later. Those biomass protesters were back, playing hopscotch! Industrial Authority board meetings have turned into sidewalk cultural events. 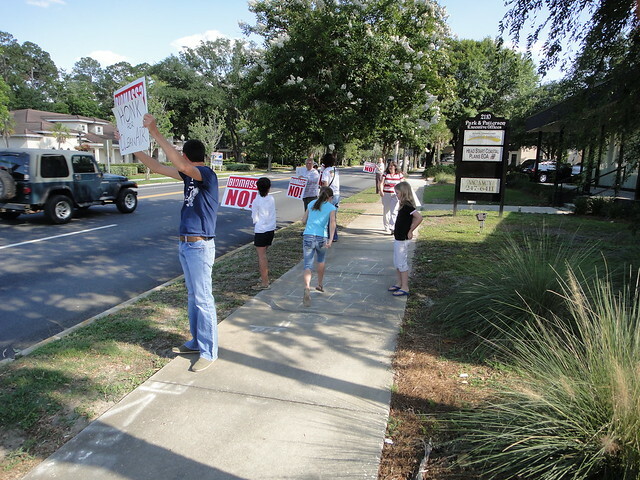 This was outside the 17 May 2011 meeting. 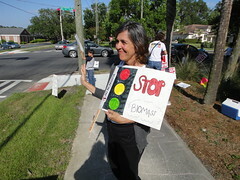 A couple of different signs: Susan Wehling with her traffic signal stop biomass sign, and a Honk for Clean Air sign. Skipping in to the Industrial Authority office to file an open records request, I noticed all five board members in the board room having a meeting. So I asked whether an appointed board was bound by the same state law as for an elected body that it had to announce meetings in advance. Lu Williams said that it was a special called meeting, that they sent a notice to the VDT, and yes, they were bound by the same rule. I asked if I could have a copy of the agenda of the meeting in progress. She said they had all the copies in there but she would get me one later. A few minutes later I went back and asked if they were in executive session. She said yes, they already went from the open called meeting into executive session to discussion personnel. Tuesday, May 17, 2011 5:30 p.m.